The U.S.government was finally able to pin a felony on Barry Bonds (assuming the verdict isn’t set aside by the judge), and it only took six years and about $10 million to do it. Considering that the original indictment included 11 counts, the lone guilty verdict doesn’t seem like much of a victory for the prosecutors. Even in baseball’s generous salary structure, eight figures is a lot to pay for a batting average below .100. 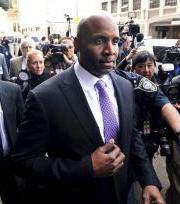 Barry Bonds leaves court after being found guilty on one count of obstruction of justice (Photo: AP). Perhaps the ultimate irony in the Bonds’ trial was that the slugger’s only conviction came on an obstruction of justice charge that wasn’t directly related to his alleged use of performance enhancing drugs. Essentially, Bonds was found guilty of making bizarre statements to the grand jury. Although some of the comments do seem evasive, one wonders if the jury ever witnessed one of the homerun king’s past press conferences? If so, they might have viewed Bonds’ rambling, defensive responses in a different light. Regardless of how you feel about Bonds, or the government’s conduct in its dogged pursuit of him, it’s hard to draw any meaningful conclusion from the outcome of the trial. In fact, much like most of the attempts to delve into the root causes of steroid era, nothing was really accomplished. Like the many sanctimonious media exposes, the commissioner’s Mitchell Report, and Congress’ investigative committee hearings, the Bonds’ trial was a charade…a way to shift blame and justify a false sense of moral superiority. Not surprisingly, many in the media have used the conviction as either a vehicle of vindication or a means to overstate the ramifications of the steroid era. Howard Bryant’s ESPN column is a perfect example. Incredibly, he tries to argue that the use of steroids was as shameful a stain on the game as the era of segregation. According to Bryant, segregation was a “societal issue”, which somehow mollifies the blight. This is exactly the twisted logic that has elevated the personal use of chemical substances to the heights of immorality. Bryant’s exaggeration goes even further by suggesting that the steroid era is the most “discredited period in the history of American professional sports”. Of course, Bryant’s assessment ignores the hundreds of NFL players who used steroids in prior eras, not to mention the rampant use of amphetamines that existed for decades in every major sport. Such inconvenient truths apparently don’t fit nicely into the narrative that has turned baseball’s steroid users into villains. If Barry Bonds hadn’t been implicated in the BALCO scandal, one wonders if the moral outrage over steroid use in baseball would have been so vocal? That’s all water on the bridge now, but in the process, several other great players have been swept away in the tide. Roger Clemens, Alex Rodriguez, Manny Ramirez, Sammy Sosa, Rafael Palmeiro, Mark McGwire and David Ortiz have all been implicated as steroid abusers, which has obviously created quite a dilemma for the Hall of Fame. After all, when you can construct a team of non-Hall of Famers that is better than one consisting of those enshrined, that conflict can’t be ignored. Before all is said and done in the legal arena, Barry Bonds could wind up being vindicated if the obstruction verdict is overturned, a strong possibility according to many legal experts. However, for most baseball fans, the only important verdict is the one that takes places in Cooperstown. Although it doesn’t seem likely that Bonds will be enshrined anytime soon, that negative verdict could also eventually be set aside. As a more educated Hall of Fame electorate emerges, or a more efficient voting process is adopted, deserving players like Bonds, Clemens and Rodriquez, among others, should gain their just reward. Although some would like to selectively erase the past, the steroid era is a permanent part of baseball’s history. The players were real and their performances are permanent. That’s why, like it or not, Barry Bonds is still the all-time home run king. A felony on his record doesn’t erase the ones he set on the field. Nothing can change that…not a federal conviction nor Hall of Fame voter vigilantism. I can appreciate your emotion, but your rant is short on rational discourse. No matter how much one detests Barry Bonds, he ranks as one of the best players in the game. When someone is able to quanitfy the impact that steroids had on his performance, I’d be more than happy to reassess that opinion, but in the meantime, I have no problem regarding him as one of the all-time greats. No, if you really want to split hairs, I guess we could toss out guys like Ruth, Williams, Cobb and Gehrig because they didn’t have to face the very best competition because of segregation. Similarly, Mantle should be disqualified because he heavily used amphetamines. Instead of getting bent out of shape over the advantages taken by the modern player, it makes much more sense to judge each era in its own contest. Ruth was great because he absolutely dominated his environment. The same is true of Bonds. Barry Bonds was not cleared of 10 counts of perjury. He got a hung jury. The man whose testimony would have either cleared Barry or made a conviction a sure thing refused to testify. Greg Anderson remained silent. The perjury counts basically come down to this; he was asked questions and gave answers that are provably false. If Bonds knew the true answer at the time then his reply consisted of perjury. The jury split on whether it is beyond reasonable doubt that Barry deliberately lied. the argument, as it would be misleading to pretend to knowlege one didn’t have (i.e make stuff up) and misleading a grand jury would seem to be one way to obstruct justice. qualified to say whether the jury verdict is correct. those produced without such cheating. sleep. The problem with steroids, particulary desighner steroids in combination with growth hormones, is that one can play better with them than without them. Hence the perfectly understandible outrage on behalf of those who stayed clean. Any evidence to suggest that designer steroids improve performance? If so, I’d love to see it. Most of the studies done suggest HGH has no impact on muscle building, but I am open to evidence to the contrary. As for amphetamines, they are a stimulant. There’s every reason to believe they helped players get on the field, which is a performance enhancer. I have no problem with someone who expresses outrage about taking illegal substances, but then you can’t be selective. If Barry Bonds is a cheater, then Willie Mays, Hank Aaron and Mickey Mantle were too. Is there any evidence that steroids improve performance? Let’s see: there are the many sprinters who ran faster on Steroids. That is one aspect of playing baseball, so it follows that steroids must help at least in that respect. The evidence for his effect is overwhelming–sprinters who used almost universally bettered there best times. Item 2, the desighner steroids improve reaction time, which certainly can’t be a negative at the plate. The BALCO Products effect is biologically proveable; the only issue is how much advantage an already skilled hitter would derive, and whether an unskilled hitter would gain any measurable advantage. later ages. That means you can hit the ball further once contact is made. It follows that a program such as BALCO provided Barry Bonds would almost be certain to enhance his performance from his already awesome 1992-1997 level. Greanies, on the other hand, do nothing to improve strength, their effect on endurance is primarily to keep the mind from being aware of muscle fatigue and lack of sleep. I have heard it claimed that they speed up thought processes, and allow for greater muscle effort, but my personal experience says otherwise and I know of no clinical data to back this claim. Hence I conclude that “The Clear and the Cream”was a much more effective way of CHEATING than taking greanies. First off, you need to make a distinction between anabolic steroids and designer substances like HGH, which preliminary studies suggest have no anabolic qualities. That aside, can you cite any evidence to support the claims you made above? Does HGH really improve reaction time, for example? If so, I’d love to see the study that came to that conclusion. Ironically, you seem willing to accept unproven effects of designer steroids, while willfully ignoring the scientifically proven impact of amphetamines. Without greenies, it might not have been possible for Mantle, Aaron, Mays, etc. to play in so many games, so on that basis alone, they were performance enhancers. You simply can’t absolve the heros of the past and then villify the modern players.